This chapter starts with an outline of a recent real-world location planning problem. It provides the analysis of different decision tasks in a typical location planning scenario and reveals the interactions between individual decision situations of the tasks. The generic decision task regarding which regions should be incorporated into a supply network is addressed. A further part is dedicated to the identification of explicit location proposals for those regions that contribute to supply chain cost efficiency. The multiple factor search for the right location for a facility in a region is addressed in the final section. The chapter is completed by the respective E-Supplement providing additional case studies, Excel templates, tasks and video streams. 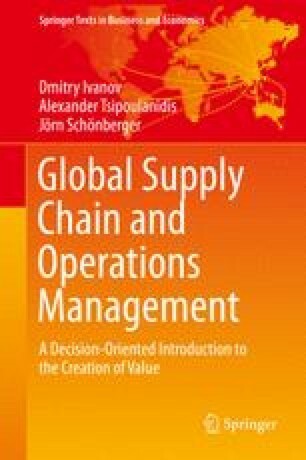 Find additional case-studies, Excel spreadsheet templates, and video streams in the E-Supplement to this book on www.global-supply-chain-management.de! The authors thanks the OTLG GmbH & Co. KG for the permission to use the company materials in this textbook.